Im 2018 we open Corachan Nord, a 1,500 m² outpatient building located on Tres Torres Street no. 7 to which the specialities of internal medicine, paediatrics, dermatology, cardiology, pneumology and allergies have been transferred. The building houses the latest trends in healthy materials, and has excellent, universal, barrier-free accessibility and antibacterial handles on all the doors of the enclosure, which guarantees advanced, complete and quality healthcare. The new Emergency Service has a separate area for ​​adults and paediatric needs and is accessible from Buïgas Street on foot, by car or by ambulance. It has 11 boxes for adults and 4 for children, a resuscitation room, state-of-the-art technology and more spacious and comfortable waiting rooms. 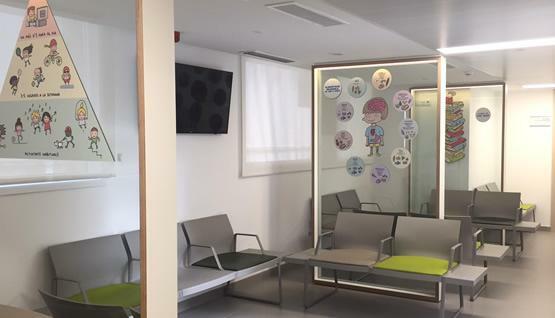 The location of the service on the same floor, together with the diagnostic imaging services, as well as the direct connection to the obstetric and surgical areas, facilitate efficient care and make it possible to offer fast, optimal service with our usual personalized and approachable treatment. The new emergency department has 24-hour special attention with the specialities of Internal Medicine, Paediatrics, Gynaecology, Traumatology, General Surgery and Paediatric Surgery, and have the entire clinic’s permanent support: healthcare and high-level medical staff, ICU, neonatal ICU, Coronary ICU, interventionist cardiology (primary angioplasty) and supplementary diagnostic tests 24 hours a day. Clínica Corachan has opened a new obstetrics area that includes three rooms for foetal monitoring, four delivery rooms (one for natural births) and two comprehensive surgeries specifically for surgical delivery. The delivery rooms have hydraulic beds adapted for giving birth and with warm natural light to create an intimate and cosy environment. The natural delivery room is equipped with a bathtub and other systems to promote physiological delivery. The two new obstetric surgery rooms are fully equipped with the latest technology to provide a quick and effective response to any intervention, whether urgent or scheduled, and have online access to the patient’s entire medical data via a monitoring centre that collects and centralizes all records of both the patient and her baby. In summary, the new facilities unite the obstetric and surgical parts and combine the latest technology with a warm, close and intimate environment that promotes the creation of a close bond between the mother and her baby from the start. With the definitive start-up of the new Corachan IV building, Clínica Corachan is set up as a comprehensive 40,000 m2 hospital centre where high quality healthcare service is offered to patients. Fully surrounded by natural light, the new facilities are outstanding for their comfort and warm environment in the areas enabled for patients, for their modernity and the most advanced technology in emergency services, in the surgical block, in the obstetric area and in the diagnostic imaging service, for the streamlining of internal and external routes, for the improvement in getting about and accessibility, and for the firm commitment to energetic sustainability. Modernity and comfort are at the service of the best medical healthcare assistance. Clínica Corachan has made a significant effort in improving accessibility and mobility in its facilities. They have included a new wide access from Buïgas Street, which allows direct entry to the emergency department and other areas of the Clinic such as the restaurant. A new 5-storey car park has been opened with a total of 400 places and spaces reserved for the handicapped. New overall signage has been designed for the whole hospital complex that promotes easy location of services and visits. Four more elevators have been incorporated for services and visitors. Clínica Corachan has opened a new surgical block consisting of five, new integrated operating rooms, three outpatient surgery rooms, a new resuscitation room, an endoscopy room and a new sterile material production unit. The new operating theatres promote a more agile, comfortable and safe activity for both patients and professionals. They are equipped with aerial towers that adjust to any surgical procedure, however complex it is, as well as high-definition screens that allow complete visualization of the surgical field; direct connection in real time to the diagnostic tests and to any patient data, and online communication with the outside. The naturally lit Resuscitation Room has eight boxes with centralized monitoring. The Sterile Material Production Unit has cutting-edge technology: autoclaves, ultrasonic washers, cold and high temperature sterilization and a sophisticated instrument traceability system that allows control, knowledge and recording of the entire sterilization process. A new high-tech, fully equipped surgical block for high-level surgery to offer the best surgical and post-surgical care of patients. All operating theatres have received the maximum ISO 5 “Class A” safety rating. This qualification certifies Clínica Corachan’s commitment to the safety and well-being of patients. Between 2014 and 2017, we opened 23 new rooms and we have renovated 12 more, expanding our hospitalization capacity from 136 to 159 beds. With warm colours, lights and materials, the rooms are designed to offer a comfortable and welcoming stay to our patients and their companions. Individual, exterior and furniture with comfortable and functional design, and which are equipped with adjustable beds with electric remote control, chairs for patients with different positions, centralized system to call nurses with intercom, full bath, independent and assisted, sofa bed for companions, desk, safe, plasma TV, telephone and Wi-Fi. Modern rooms equipped for comfort and assurance.